When the author was asked to lead employee communications for Intel in 2006, he saw it as a communications role with a certain audience: employees. He never expected how important those employees would become to him, and how differently he’d come to see the “communications” assignment. What does every employee need to thrive? She wants to believe in the organization’s purpose, belong to a team of people helping one another soar, and feel that she matters in two ways: she is essential to the team’s success, and she is valued by the leaders of the organization. Communications can play an outsized role in creating and fostering that environment of “believe, belong, and matter.” In Aiming Higher, Michael Green offers a way of looking at that opportunity—that obligation—and challenges communicators of all types, from executives to communications practitioners, to step up. 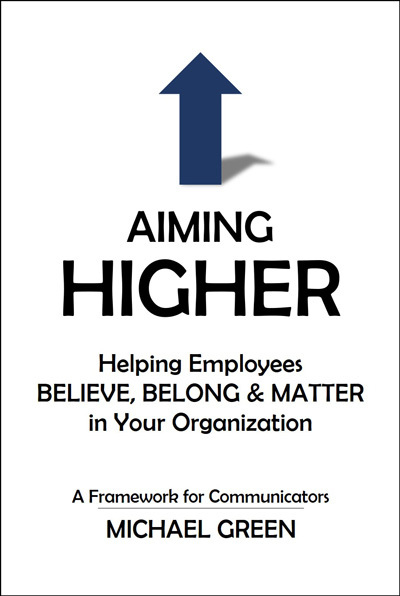 Aiming Higher: Helping Employees Believe, Belong & Matter is available on Amazon. “I wish I could give this book to my management chain. It is well written, thoughtful, playful, and an offering of humble curiosity (like a gentle exploration guide more than a list of commandments or Truth).